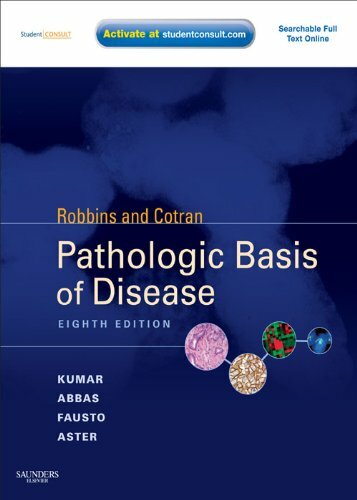 One of the best-selling medical textbooks of all time, Robbins and Cotran Pathologic Basis of Disease is the one book that nearly all medical students purchase, and is also widely used by physicians worldwide. A "who's who" of pathology experts delivers the most dependable, current, and complete coverage of today's essential pathology knowledge. At the same time, masterful editing and a practical organization make mastering every concept remarkably easy. Online access via Student Consult includes self-assessment and review questions, interactive case studies, downloadable images, videos, and a virtual microscope that lets you view slides at different magnifications. The result remains the ideal source for an optimal understanding of pathology. Demonstrates every concept visually with over 1,600 full-color photomicrographs and conceptual diagrams - many revised for even better quality. Facilitates learning with an outstanding full-color, highly user-friendly design.